Thank you to my friend, Judy Lynne, who shared this word with me today. I know I do it, but I didn’t know there was a word for it. And I love that it’s an Old English word–takes me back to college days and my History of the English Language Class where we learned to read in Old and Middle English. 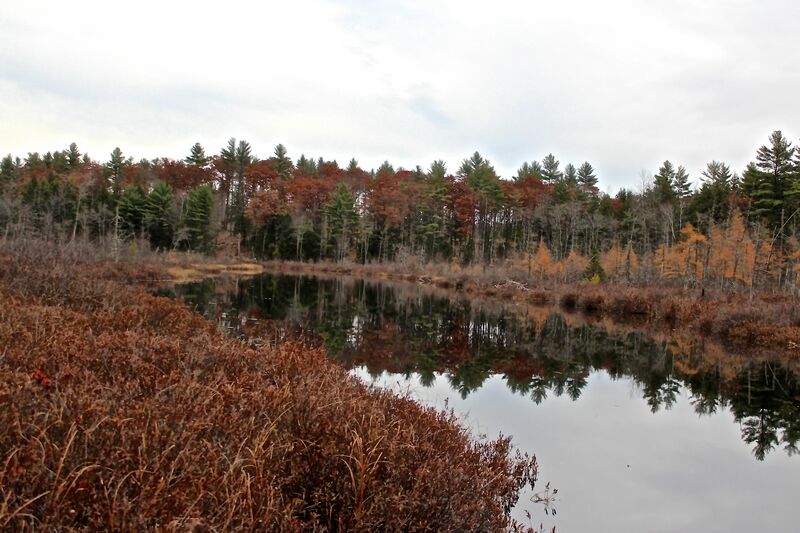 And so it was that today I wandered longingly through the forest in search of mystery with five other naturalists–all MMNP grads who will bring the Master Naturalist course to Bridgton in the spring of 2016. After a tour of Lake Environmental Association’s Maine Lakes Science Center, we took care of some housekeeping items (coursework) before heading out the door. I made them practically run through Pondicherry Park–well, maybe run is an overstatement, but we moved quickly for us–not much time for werifesteriaing. 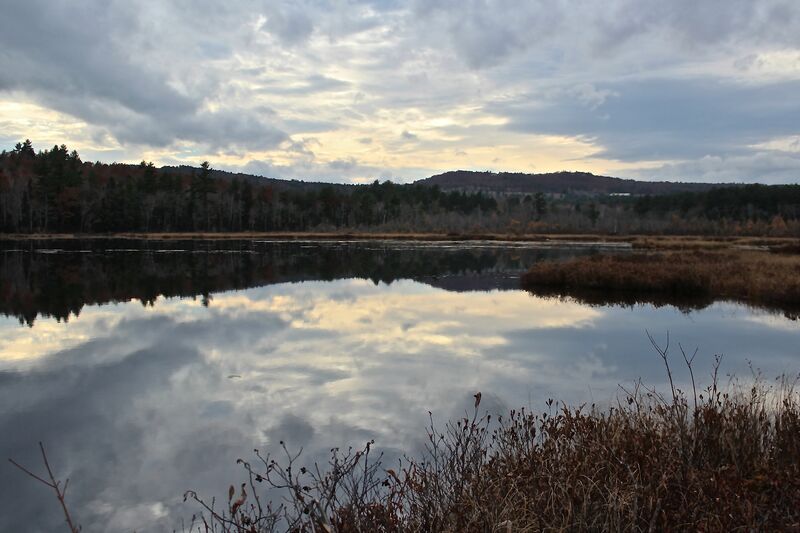 It was our afternoon tramp at Holt Pond when we allowed ourselves more time to pause and wonder. 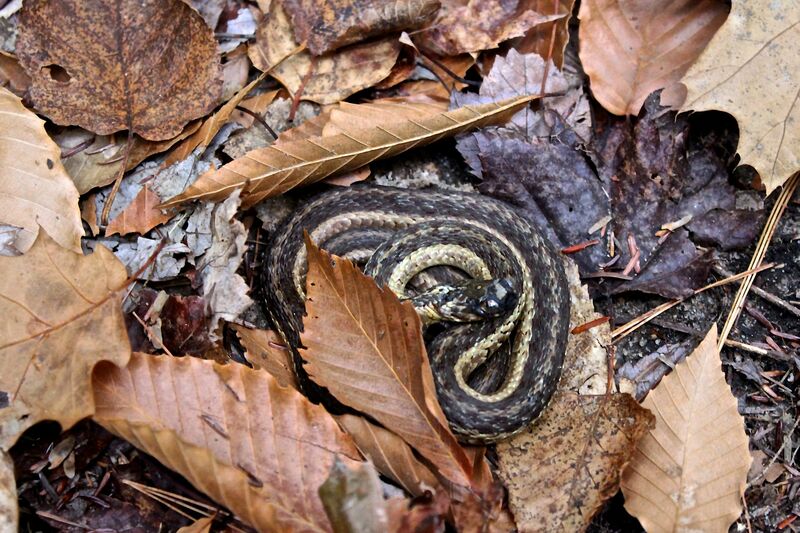 As we started down the trail, Beth saw this snake hidden among the leaf litter. It’s the third garter snake I’ve seen this week. 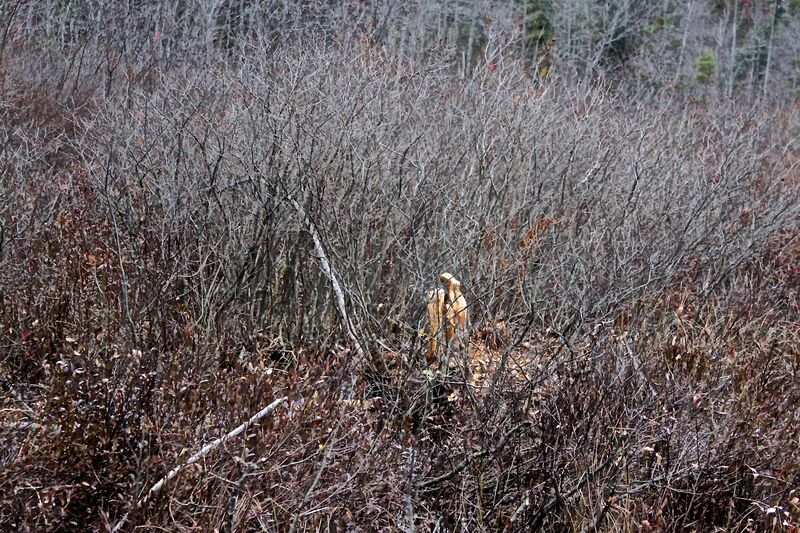 The day was overcast and we weren’t sure if he was coiled up because he was cold or if something had attacked him. We stepped onto the boardwalk to view the Muddy River and it almost sank beneath our weight. The water is quite high and I suspect I know why. Off to the side, we saw fresh evidence of beaver works. And in the river, a lodge topped with new sticks. I think the dam down the river has probably been rebuilt. 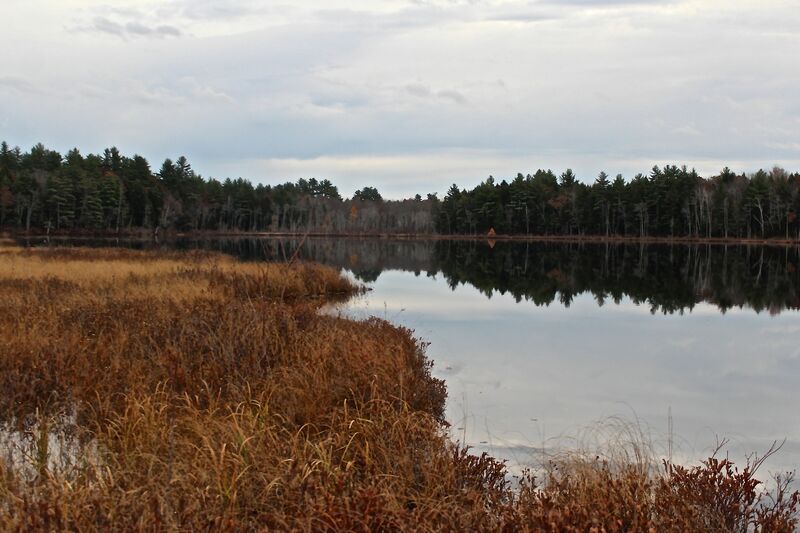 Looking from this vantage point, the layers of communities are pronounced, with the wetland plants like leatherleaf, sheep laurel and sweet gale growing low by the river, topped by alders and small red maple trees, topped by tamaracks, topped by white pines, hemlocks and Northern red oaks. 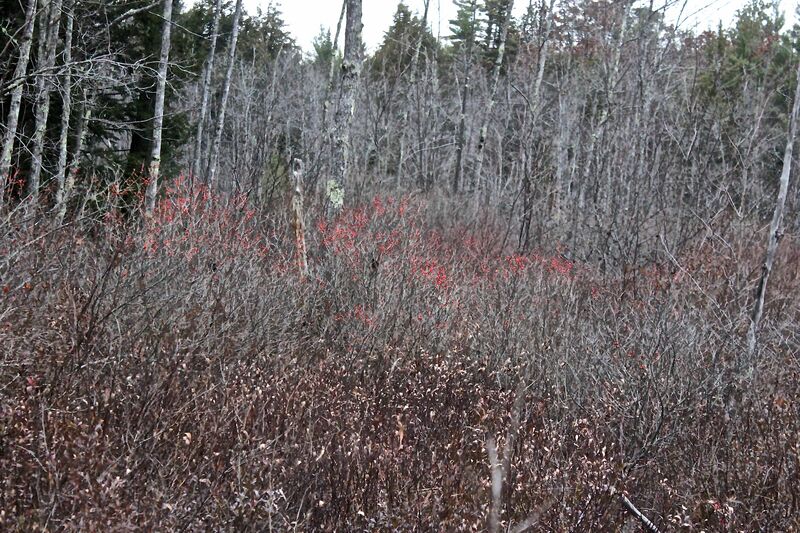 Similar layers surrounded us with the bright red winterberries forming the creme between two wafers. 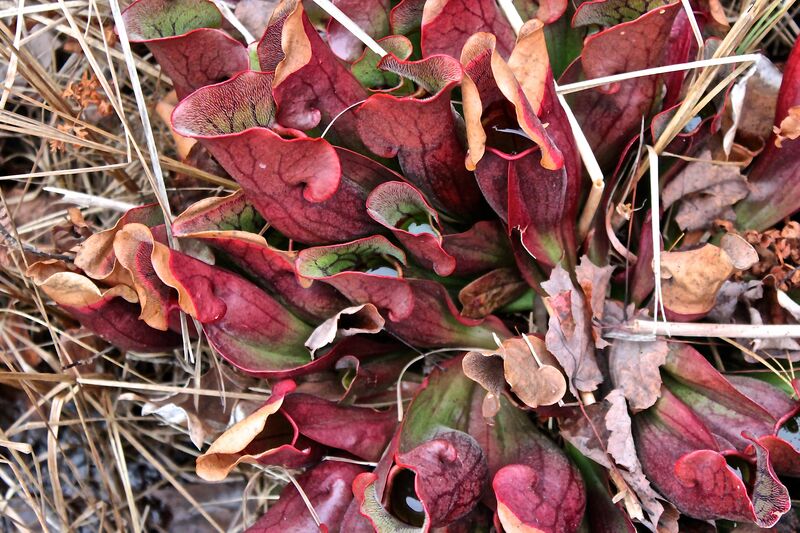 As happens each time I pass this way, I am forced to photograph the pitcher plants. Have you ever noticed the pictures on the hairy inner lip? Do you see what I see? A woodland landscape–trees with extended branches, a layer of colorful foliage and a grassy edge leading to the lake (water in the cup)? I know the hairs and design are important for the attraction of insects, but I never really paid attention to the actual design before. 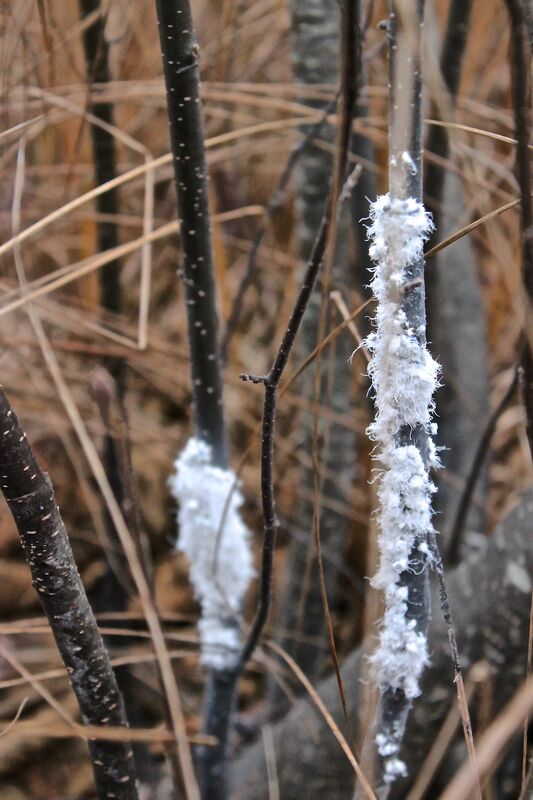 We also found more woolly alder aphids, which Joan and Ann held in their hands so everyone could get an unclose look at the squiggly insects. 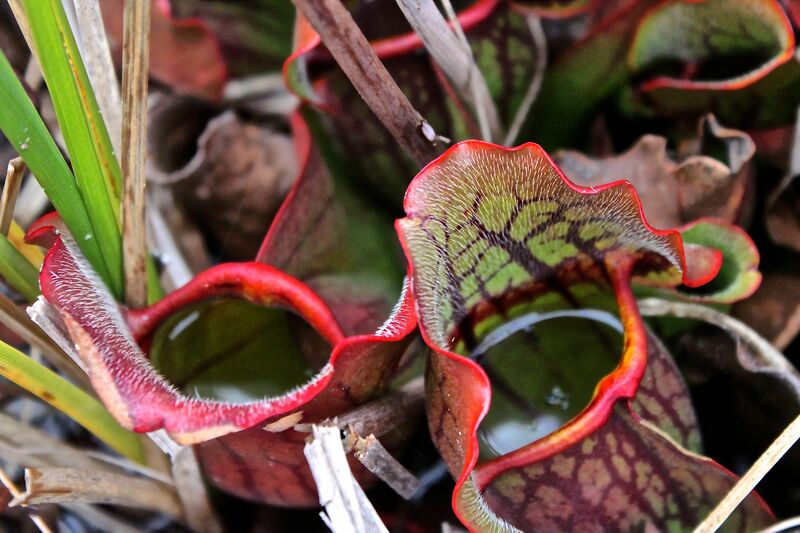 Rather disgusting, yet fascinating. 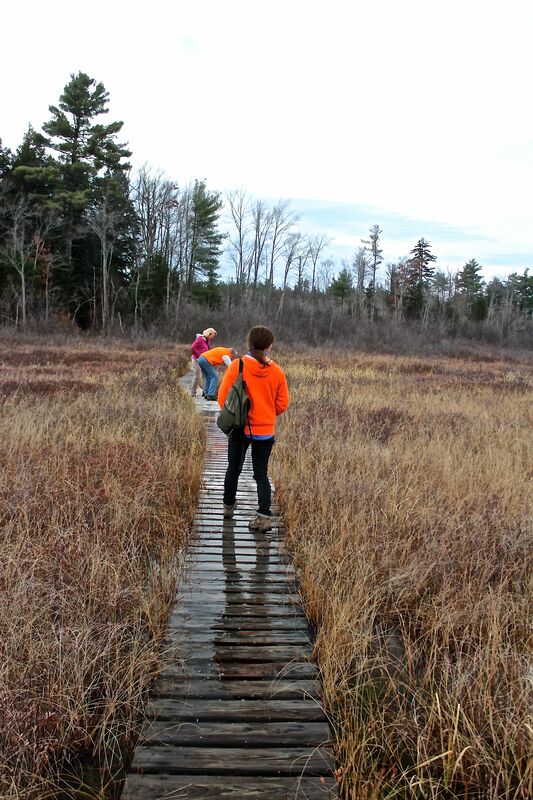 Gordon, Beth and Joan tried to keep their feet dry as we examined the plant life along the quaking bog boardwalk. 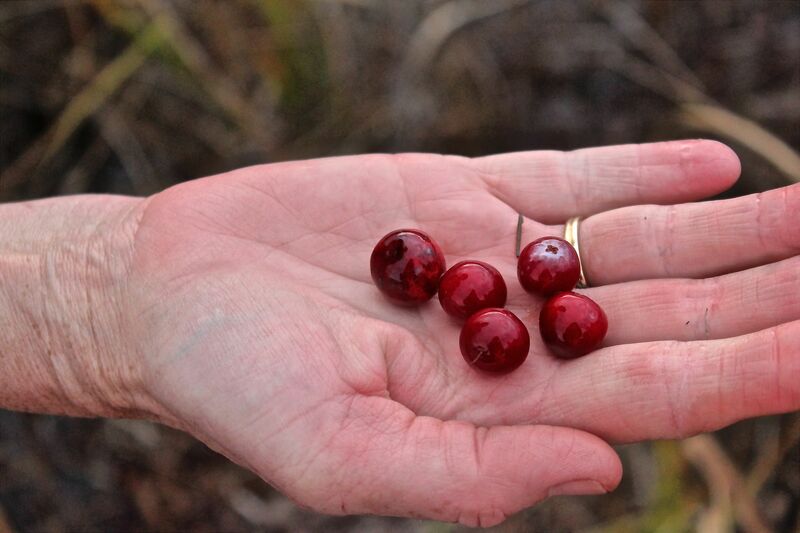 Karen spotted one cranberry and then another, and another, so everyone could sample the tart flavor. Pucker up. 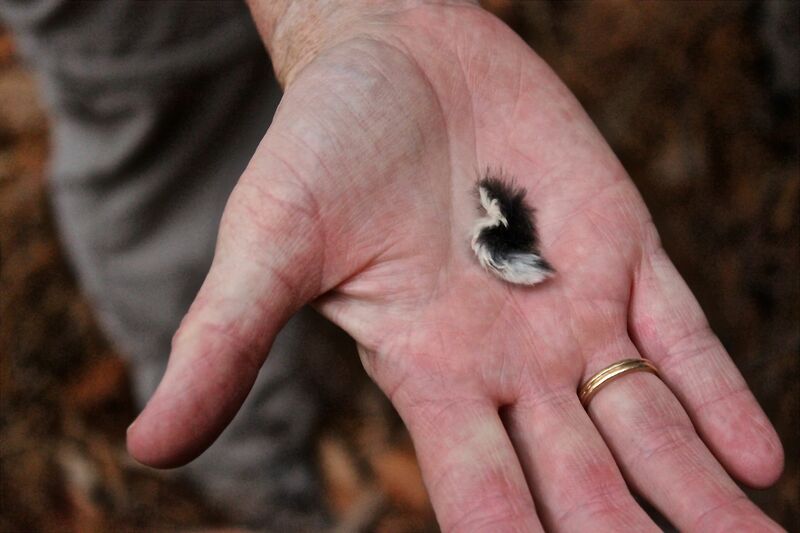 Our next fun find–a raptor pellet comprised of hair and bones galore. For the naturalist course, this will come into play. Every once in a while, I’d ask if it was raining. 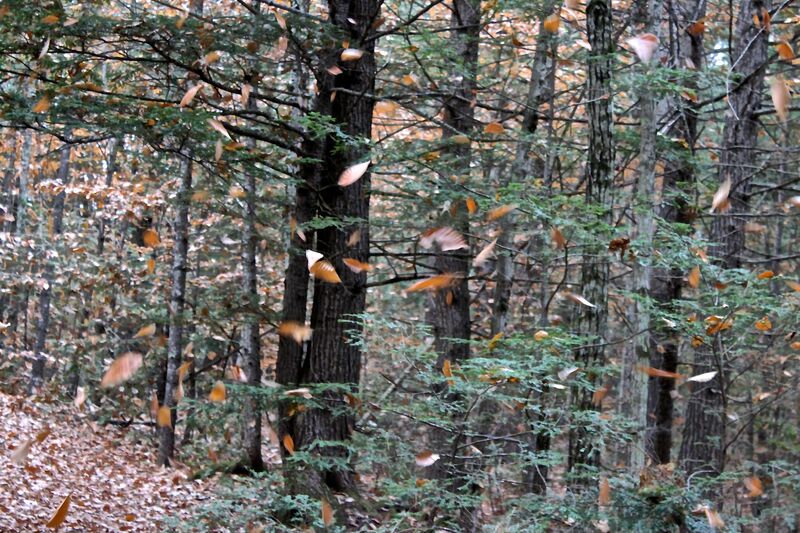 It was–beech and oak leaves. 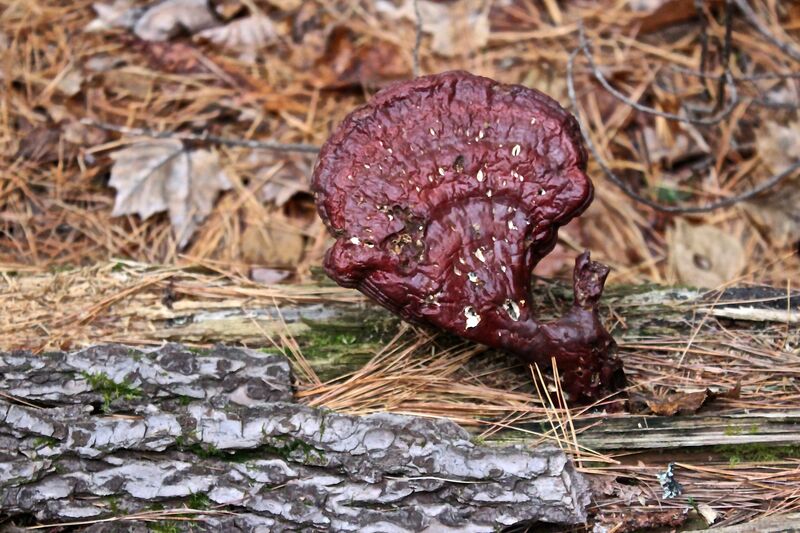 While we stopped to admire several older hemlock varnish conks, something else caught our attention. And then Ann spotted this little tidbit–leftover from someone’s dinner. We still don’t know who ate whom. 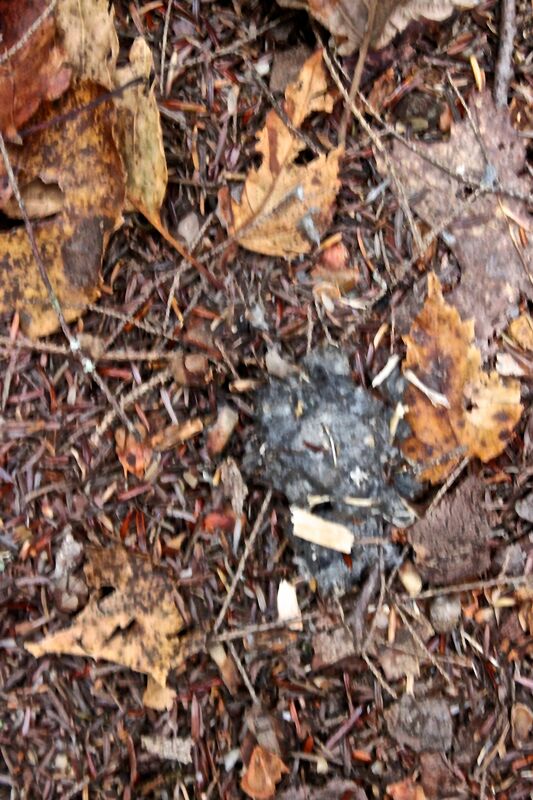 Or if it was related to our earlier find of the pellet. What we do know is that we spent a delightful day werifesteriaing along. 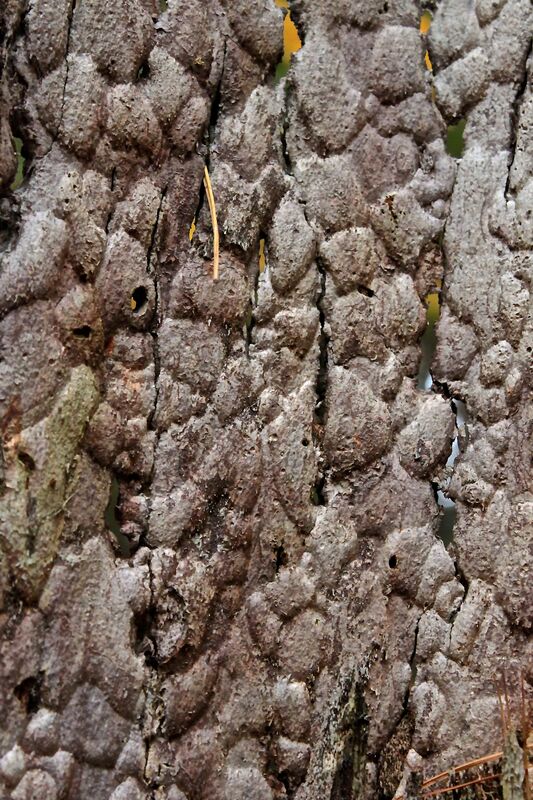 As for the mystery photo–the inside of hemlock bark. 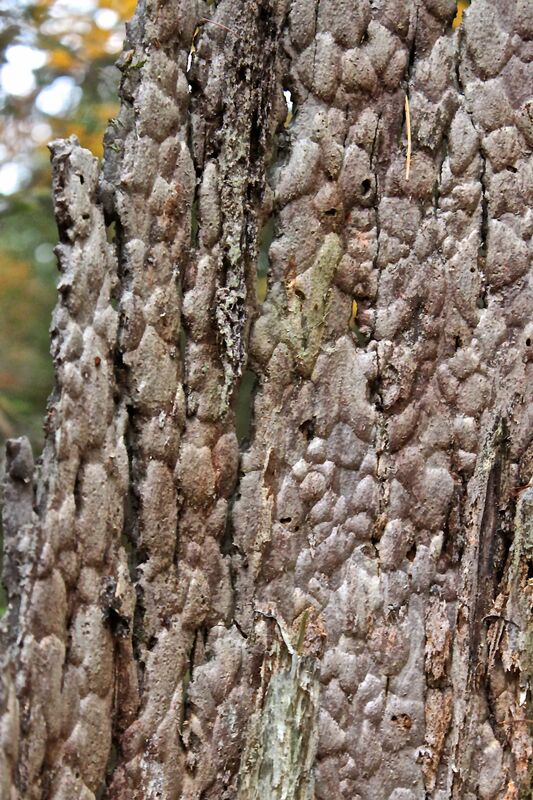 This is the bark that I think of when trying to remember how trees decay–hardwoods rot from the inside out, softwoods rot from the outside in, but hemlock bark often remains. 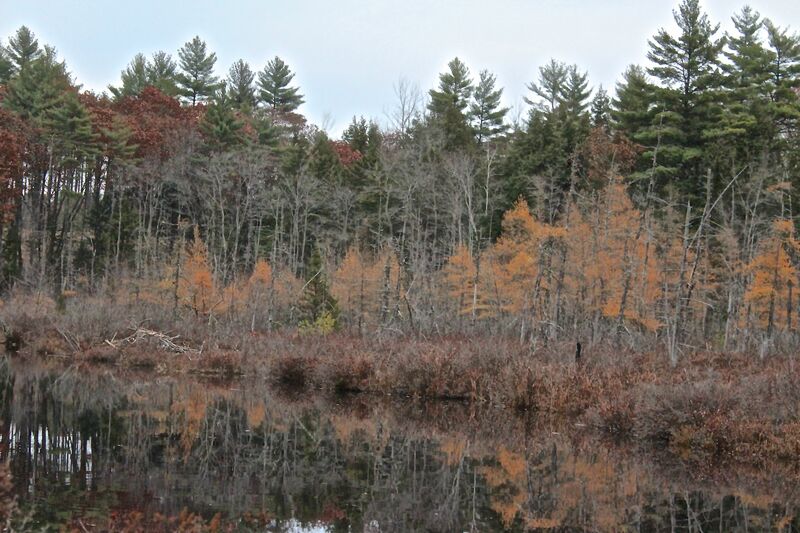 In the 19th century, hemlock bark was used in the tanning process because the tannins found in the bark preserved a hide and prevented natural decay while giving it a brown hue. At the same time, the tannin left the leather flexible and durable. 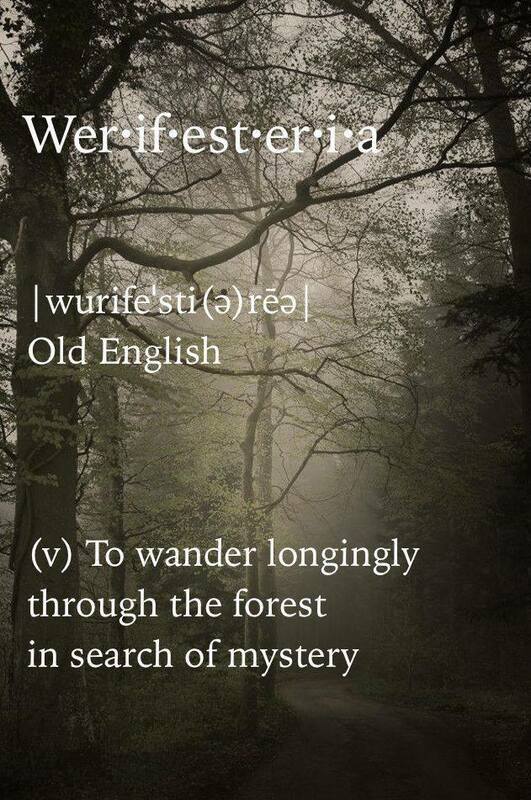 Here’s hoping you’ll have the opportunity to wander longingly in search of mystery.